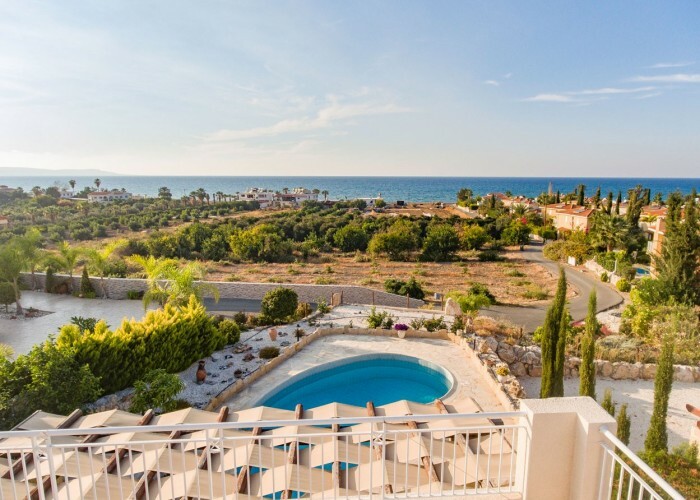 This stunning 4 bedroom detached villa with full TITLE DEEDS is located in a quiet exclusive development in Argaka, 100 metres walk to the beach and offers spectacular views over the Mediterranean. TITLE DEEDS and FULLY FURNISHED. In many ways this property is in the ideal location as it overlooks agricultural land down to the sea. These views will never change and the current owners tell of sitting on the vast balcony watching the sun rise in the east in the morning and then enjoying an al-fresco breakfast. At the end of the day, over a Brandy sour they witness the spectacular sunsets over the Akamas peninsular to the west. As the property is slightly elevated the views are uninterrupted. The villa is approached along a private road. Once through the double gates and along a driveway large enough to accommodate 4 cars easily and lined with beautifully maintained and brightly coloured flowers and shrubbery we come to the front door. Once inside the villa it is the attention to details which is immediately apparent. A perfect example of this is the delightful archway which leads into the kitchen adding interest and character to the property. The lounge/diner has patio doors for easy access to the sun soaked pool and patio area. Incidentally this area is illuminated after dark thus adding to the almost mystical charm of the exterior. The well equipped kitchen includes many cupboards, space granite worktops, washing machine, dishwasher, oven/hob and extractor fan. A door leads from the kitchen directly to the garden. The first of the four bedrooms is on the ground floor. This is a double with large windows allowing plenty of light into the room. The wardrobes are housed In a recess leading to the main room. A conveniently placed cloakroom completes the rooms on the ground floor. The master bedroom is large with en suite bath and shower facilities. There are superb sea views, a generous amount of wardrobe space and state of the art modern finishes. The second bedroom has mountain views and its own secluded, private balcony as well as en suite shower facilities. The final bedroom is next to the door leading to the massive sea facing balcony mentioned previously. Local amenities are within easy walking distance and the major facilities, banks, shops etc are available in the town of Polis which is only 5 minutes drive away. Argaka has a selection of bars and restaurants, several are on the water front. There is also a bakery and supermarket. The traditional market town of Polis with its paved streets, and wide range of facilities ia a ten minute drive away. The upmarket marina of Latchi with its tavernas, shops, exciting water sports and crystal clear waters is 15 minutes by road.